Protoclassic, ca. 100 B.C. 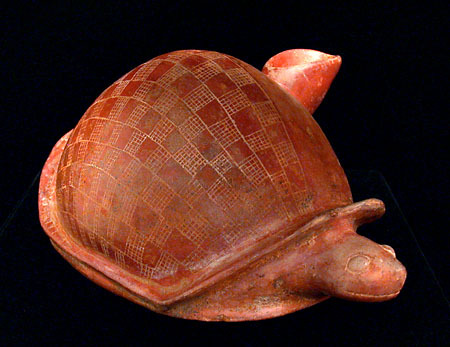 to A.D. 250, with burnished red slip and decorated with multiple geometric designs incised over more than half of the shell, ten rows in all. The shell is naturally formed with flanged edge all around, the head protrudes from the shell with large eyes, mouth, and rudimentary nostrils together forming a pleasant demeanor. The tail points from within the rear of the shell, and the spout rises from the left side of the shell. Condition: This turtle has two small chips in the edge of the rear part of the shell near the tail, and two minor chips along the bottom edge of the base. He is in otherwise excellent condition. Height: approx. 6 in. (15.2 cm. ); Length: 12.3 in. (31.2 cm. ).